Travel by car is easy, but from Paris travel by train is even easier, with direct TGV high-speed service to Aix-les-Bains in only 3 hours. Aix-les-Bains is 576 km (358 miles) southeast of Paris (map); 390 km (242 miles) north of Marseille; 106 km (66 miles) east of Lyon by Highway E70; and 70 km (44 miles) south of Geneva (Switzerland) by Highway A41/E712. Direct TGV trains connect Paris (Gare de Lyon) and Aix-les-Bains, making the journey in about 3 hours. Other trains and routes can take up to 4 hours. TER regional trins easily connect Aix-les-Bains to Geneva and Grenoble. The nearest major airport to Aix-les-Bains is that of Geneva, Switzerland. 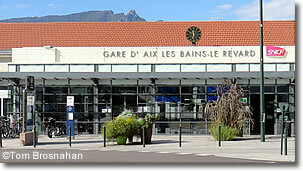 Nearby Chambéry, only 18 km (11 miles) south of Aix-les-Bains, has a smaller airport for regional flights. Gare d'Aix-les-Bains - Le Revard, between the lakeshore and the town center.